The Phoenix Lifting team recently installed a new Freight Mate Goods Hoist for a new food production facility in Sydney. With production on the ground floor and storage above on the mezzanine floor, our client required a robust yet cost effective solution to assist with transferring ingredients floor to floor. The floor to floor height was 3900mm therefore the 1500KG capacity Freight Mate 4000 was the choice. Prior to installing the Goods Hoist an opening was created in the mezzanene floor to accomodate the unit. 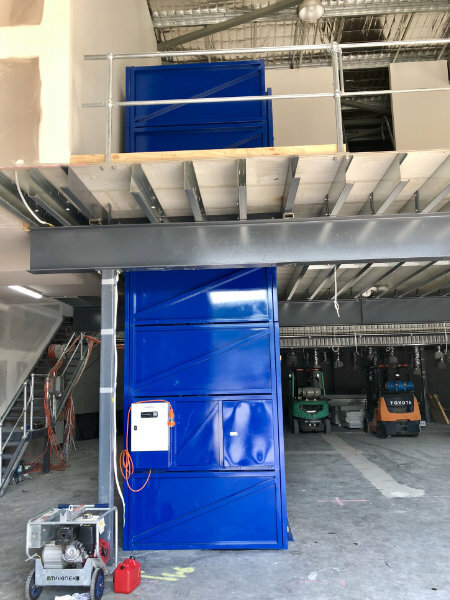 A Feltes Portable Aluminium Gantry Crane was assembled above the opening to assist with raising the top section of the Freight Mate so we could then install the base of the unit underneath. The site did not have any 415v power connected as yet so a Generator was hired to power up the unit for the install and testing (All units are shipped with a 415v power cable and plug). Our client is delighted with the hoist and we look forward to powering it up prior to the facility opening.